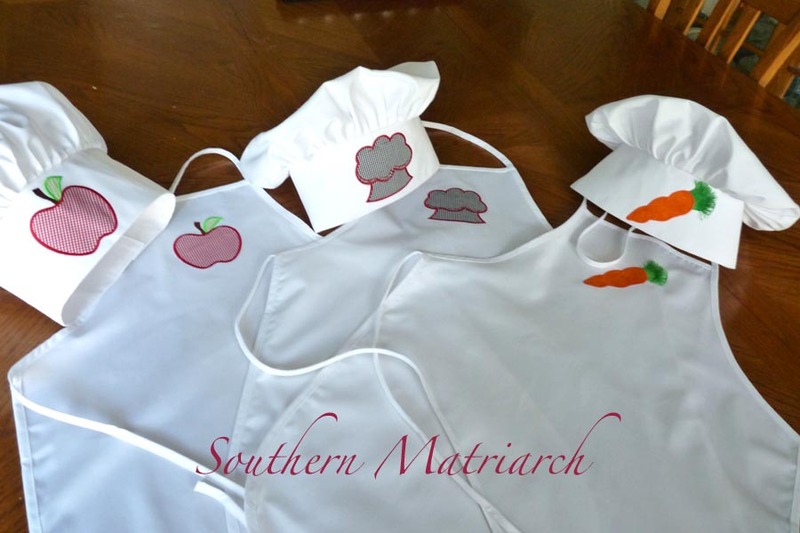 Southern Matriarch: Let's Get Cookin! My daughter had a project recently that she conscripted her mother's help. It was a kids nutrition program. So for door prizes we machine embroidered some ready made aprons and made chef hats to match. It didn't take near as long as we feared and the results were well worth it. For the chef hat we used a tutorial on the blog for Michael Miller fabrics called Making It Fun. The only changes I would make to the directions are it takes more than 35 pins to form the pleat/gathers. Not sure where that arbitrary number came from. The other change would be where the directions tell you not to press the creases out of the circle that becomes the top, I would press them out except for the creases at the very edges to mark the quarter marks of the circle. It is really too difficult to press the top once the hat is constructed. Our chef hats are made from a twill. If using a heavier fabric like that, make sure you have at least a size 90 needle in the machine. Otherwise your needle will not get through all of the layers. Just something fun and quick without a whole big bunch of time or cost. The aprons were half price at Hobby Lobby, so three of them for $5. Hope you have something fun to work on. I have the baby's Easter bishop finished and will post pictures tomorrow. Actually it has been finished for several days. A record for me. They turned out so cute! Congrats on completing that bunny bishop early. Enjoy this first Easter with your little princess! They are very cute and the perfect door prize.